by brouillard Posted 2nd Jun 2007 at 11:32 PM - Updated 7th Jun 2007 at 10:05 AM by brouillard : Added some requested Close-Up shots! A set of france-friendly recolours of signs, pictures... for France-loving sims, and french-like lots ! 1. "Rainy Day Main Street"
3. "Two Dogs and an Olive"
To make my paintings recolours visible, don't forget to install the CEP (Color Enable Package), available at MTS2. 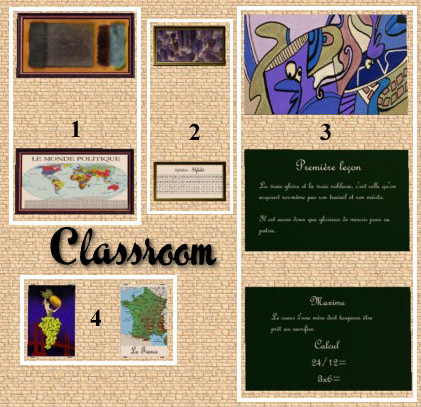 Classroom Poster Superpack- 100 Assorted School Posters!